Drei Filme, insgesamt 185 min. „Peter Turrini. Rückkehr an meinen Ausgangspunkt“, 85 min. Lesungen im Tonhof, insgesamt 35 min. übersetzt, seine Stücke werden weltweit gespielt. Three films, totaling 185 min. “Peter Turrini. Return to My Point of Origin”, 85 min. Readings at the “Tonhof”, 35 min. 30 languages, his plays are performed worldwide. Ruth Rieser, born in Klagenfurt am Wörthersee, Austria. Works as a filmmaker and actress. Trois films, 185 min au total. de 30 langues, ses pièces sont jouées dans le monde entier. Ruth Rieser, née à Klagenfurt am Wörthersee en Autriche. Travaille en tant que cinéaste et actrice. 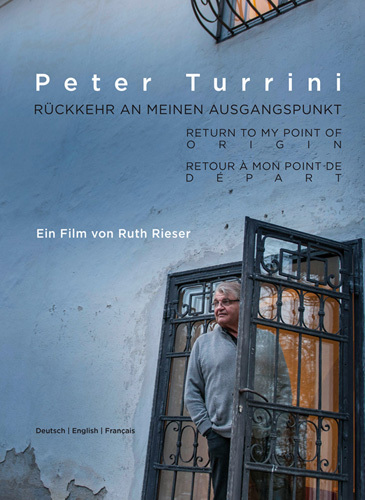 The “Tonhof” in the small Carinthian town of Maria Saal is the “point of origin” of the documentary film about and with Peter Turrini. Here, in the 50s and 60s, the artist couple Maja and Gerhard Lampersberg kept an open house for “completely unknown art nuts”, as Turrini describes it in the film — from Thomas Bernhard to Christine Lavant and many others. For the 15-year-old PeterTurrini, the “Tonhof” was a magical place, his “first place to call “home” – laboratory, enclave, cradle of Austrian post-war literature”. The late Dietmar Pflegerl, director and artistic director of the Klagenfurt City Theater, commissioned the author to write a play about this period. At the premiere of At the Fall of Darkness in 2006, it was actress and filmmaker Ruth Rieser who played Claire. now, in her documentary, with its calm rhythm and intense images, she lets the Austrian playwright speak – thoughtful, candid, gentle. Without any resentment or voyeurism, the conversation carefully retraces the heartbeat of the “Tonhof” and its late owners. The 70-year-old Peter Turrini reveals himself as an attentive friend of the young generation, gifted with a keen awareness of the now. images of the town and the estate blend with evocative readings in the barn of the “Tonhof” and in the rooms of the house, which have remained practically unchanged, to make this documentary an extraordinarily personal portrait of Peter Turrini. Preis pro Stück € 22,40,– (inkl. 20% Ust.) PLUS Lieferkosten.